They've got a noticeable but not overwhelming oregano flavor. 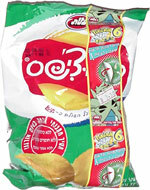 The underlying chip is similar to Lay's, which makes sense, since these are the Israeli version of Lay's. They're the first oregano flavored chips I've ever seen or even heard of. Smell test: Smells kind of like dill or oregano. Trivia: There was a Pokemon pog in the bag.